The following is the story of Nathaniel, Fred and Harry Weeks. Nathaniel Weeks arrived in England at the turn of the last century as a labourer and within a generation his sons Fred and Harry Weeks became entrepreneurs developing a business in the agricultural industry. They employed hundreds of people in East Yorkshire and their reputation was such that Weeks trailers continue to be remembered at home and abroad even today. Aspects of this remarkable partnership between the two brothers is recounted in Richards Weeks's own oral history which can be heard HERE. We are very grateful to Richard his cousins Victor, Anne and Paul and their willingness to share their family history with us. Nathaniel Paul Weeks was born and baptised in the autumn of 1871 in St Michaels, Barbados. His mother was Cecelia Allen (Alleyne) and his father also named Nathaniel Paul Weeks. He had at least five siblings, Constance, Isabella, George, Gertrude and Sarah. In the late nineteenth century, Nathaniel left his family in the Caribbean and crossed the Atlantic to start a new life in Britain. Unfortunately, details regarding his arrival have not been found. However, it is possible that Nathaniel saved enough money to board a vessel as a steerage passenger or worked on one of the many ships that returned to England from Barbados before 1900. According to a story which has circulated in the Weeks family, Nathaniel arrived in Liverpool as a teenager on board a vessel which brought fruit to Britain from the Caribbean. When he disembarked from the ship, Nathaniel asked a road sweeper where he could find work and the man encouraged him to travel to Hull. Thus, determined to start a new life, he hitchhiked across the country until he reached East Yorkshire. This must have been a long and arduous journey and it is likely that the Barbadian suffered bitterly from the cold. The first record of Nathaniel in Britain can be found in the 1901 census where he is listed as a 28 year old, single, general labourer boarding with the Maloy family at 107 Mersey Street, Holderness Road, Hull. It is possible that Nathaniel was an assistant to blacksmith and head of the household William H. Maloy. He must have been relatively close to this family as he rented a room from them for at least five years. In 1906 it was recorded in the Electoral Registers that Nathaniel paid the Maloy family five shillings and sixpence per week for a furnished bedroom at their residence. Today his rent would equate to around £65 per month. In the summer of 1911, Nathaniel married 28 year old, local dressmaker Harriet Annie Jefferson. Unfortunately, it has been impossible to find where or how the pair met. However, the Weeks family believe the partnership was greeted with some resistance from Harriet’s relatives. This may not have simply been because Nathaniel was Black, he was considerably older than Harriet at the age of 40. By 1913, the couple had moved into their own house at 15 Rosedale Avenue, Sculcoates and the following year had settled at 3 Clarence Avenue in Hull. If family stories are correct at this time Nathaniel had found a job working for the council and was receiving a stable income. During the First World War Nathaniel stayed in the region and helped on the Home Front. The couple had three sons, Fred, Harry and Ernest between 1914 and 1918. Nathaniel and Harriet must have been exceptionally proud of their sons as all three excelled at school. Unfortunately, Nathaniel and Harriet were plagued by grief in December 1933 when their youngest son Ernest died at Hull Royal Infirmary at the tender age of 15. Although, his cause of death has not been determined it is rumoured that Ernest died of tuberculosis of the hip after an accident on his bike. He is buried at the Northern Cemetery in Hull. After Ernest’s death the family moved to 121 Carr Lane in Willerby. At this time Nathaniel was in his 60s. Once he had retired, he spent time in his allotment as a keen gardener and with his family which had expanded to include grandchildren. Nathaniel also loved to ride his pushbike around Willerby even in his advanced years. In December 1951, sadly Harriet died and two short years later Nathaniel also passed away at the age of 82. Despite his Barbadian roots, Nathaniel never spoke about Black heritage, nor did Fred or Harry. Thus, the grandchildren that never meet Nathaniel, for many years did not realise their grandfather was from the Caribbean. Fred Weeks was born on 8 June 1914 and was baptised shortly after at the Wesleyan Methodist Church in Hull. He grew up at the Weeks’ family home in Clarence Avenue with his father, mother and two younger brothers, Harry and Ernest. Although Fred enjoyed studying and learning, he also liked to socialise and be outdoors. In his late teens he could be seen riding around the city on his motorbike. However, an accident in April 1933 resulted in Fred fracturing his leg. On 9 April, the Hull Daily Mail reported that Fred was turning a corner in Sculcoates Lane when his motorbike skidded and landed on him. Unfortunately, this was not his last motor vehicle accident. exercise was to climb to 5,000 feet and travel at 250 miles per hour for five minutes. If it was successful, the aircraft would be used as a submarine spotter. It could attack and perhaps catch the sub before it dived.” Fred recalled that on 7 April 1940, he and four other men boarded the aircraft, they quickly reached the correct altitude and speed to test the plane. However, after two minutes they experienced windy conditions and it became increasingly apparent that something was wrong. As the pilot tried to hold the plane steady, Fred pulled on the throttle stick to no avail. The pilot then gave orders for the crew to bail out so Fred got into a parachute and jumped out of the plane. In his interview Fred was very nonchalant and factual about the experience. His calm and cool approach to this terrifying event highlights his laid back character. He remarked that once he had jumped, he was hurtling to the ground at around 120 miles per hour, but it was only after he had counted to ten seconds as previously instructed that he then pulled the ripcord to open his parachute. When Fred realised he was going to land in water he quickly removed his parachute. This was an extremely sensible move, however in the situation this highlighted Fred’s ability to think logically even in the most difficult circumstances. While Fred and one other airman managed to escape the plane, he had no idea what happened to the rest of the crew as they did not bail out as directed. However, it is likely they died as Fred watched as the plane spiralled out of the sky. When two vessels were sent to rescue the airman it took them an hour to find Fred as they were chasing the parachute, not realising he was no longer attached to it. Once he was pulled out of the water he was taken to Glasgow. Shortly after the plane crash Fred was sent a gold caterpillar to celebrate his success in using a parachute to bail out of a failing aircraft. Thus, he became number 2,000 in the Caterpillar Club. Fred's interview with the Hull Times, October, 1965. While this experience may have prevented most from ever flying again, Fred continued to pursue his career. After this incident he joined the Air Transport Auxiliary and flew as First Officer Engineer until 1945. When the war was over he went into business with his brother Harry and flew all over the world to make new connections for their company. With his infectious smile and approachable personality, Fred had a large circle of friends and was very well liked in the community. One of his closest friends was Charles Alfred Billingham who selected Fred to be his best man in July 1942. Seven years later, in the summer of 1950, Fred was attending his own wedding to Mavis Violet Ireland. The couple waited eight years before having their daughter Gillian and until 1963 for their son, Richard to complete their family. By 1965, Fred and his family had moved to 6 Hull Road, Cottingham. During this time Fred was a part of the Humber 52 branch of the Masons, becoming the Worshipful Master in 1976. He attended dinners and became a trusted member of the community. Harry’s children remember that Fred also loved photography and had his own dark room at home. As the Weeks business expanded, Fred spent a lot of time at work or travelling, leaving Hull for Europe and Africa. Fred enjoyed visiting agricultural shows all over Britain and every year he visited Nairobi to promote the Weeks business. He also took his wife and children on holiday and loved to spend time with his family. Although Fred worked exceptionally hard, he was a kind and charismatic man who loved to socialise. Richard has vivid memories of his father hosting large house parties. Fred has been described as an entertainer who could tell a story that drew everybody in. He had friends and acquaintances everywhere who all thought very highly of him. Sadly, Fred died in March 1977 at the age of 62. Harry Weeks was born on 8 October 1916 and was the second child of Nathaniel and Harriet. He grew up with Fred and his younger brother Ernest at 3 Clarence Way. Harry enjoyed school and particularly excelled in engineering and was also a regular attender at Sunday School receiving several prizes in recognition of his attendance. 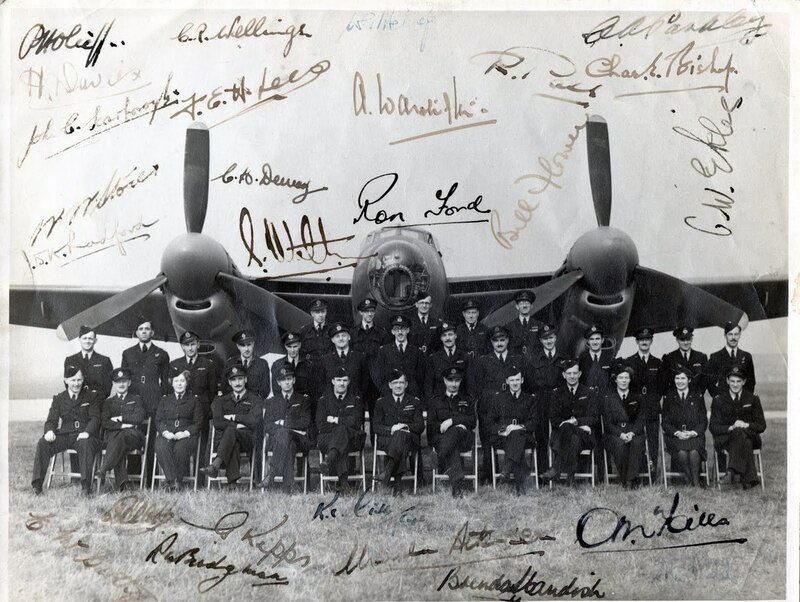 Harry remained at the Blackburn Aeroplane and Motor Company as an engineer throughout World War Two. During this time, he married his first wife and they had a son, Victor on 25 September 1942. Shortly after this date, their marriage broke down and Harry and Victor moved back in with Nathaniel and Harriet. Victor has very fond memories of living with his father and grandparents as a young child. Victor remembers that Harry was a member of the local motor club and as a young child he was often taken along as a passenger when Harry took part in motor club rallies. After the Second World War, Harry spent time nurturing and growing the Weeks business with his brother Fred. In 1950, Harry met and fell in love with Betty Amy Goundry, the couple married in the summer of the following year. In 1953 their daughter Anne was born and thirteen years later Betty gave birth to Paul completing their family. In the decade between 1950 and 1960 the Weeks business was expanding rapidly. While Fred visited farmers and worked hard to make business connections across Europe and Africa, Harry worked equally hard running the factory, being responsible for the design, development and production of new products in addition to building and creating a positive environment for their workers. They were the perfect team, no job was more important than the other and without either one the business could not have achieved its impressive level of success. Harry, Betty and Victor. Wedding day, 1951. Both Harry and Fred were regular attenders at many of the agricultural shows held across the UK with the Great Yorkshire Show being a firm favourite. The shows were a good opportunity to showcase the latest Weeks trailers and also to meet and socialise with many of their customers and friends in the farming community. In the mid-1960s, Harry, Betty, Victor, Anne and Paul moved to Kirk Ella. Harry’s children had a happy childhood. Harry greatly enjoyed family holidays, firstly in the UK and then in the late 1950s/early 60s the family began travelling by car each year to mainland Europe, initially with the family caravan and later staying in apartments or hotels. On one of those early holidays Harry learned to waterski and continued to enjoy the sport on holidays every year. Harry was keen on cine photography and took many films of the family holidays each year. In 1967 Harry and Fred purchased a very old motor coach which was adapted to provide some sleeping accommodation, and external modifications were made to enable a skiboat to be carried on the roof. Both families together with friends and relatives then travelled in the coach on a holiday to northern Spain. Harry also travelled abroad on company business on several occasions, once spending a month in Ceylon (now Sri Lanka) supervising repairs to Weeks sugarcane trailers which had been damaged in service. Sadly, Harry died suddenly aged 55, in December 1971 at the family home in Kirk Ella, East Yorkshire. His wife Betty died thirty years later on 7 July 2001. After the Second World War ended in 1945, Fred and Harry Weeks began to evaluate their future. They understood that the aircraft industry would not continue as it had during wartime and therefore decided to look to their own business acumen to ensure they had a prosperous future. As both brothers were engineers, Fred and Harry looked to capitalise on their skills. They set up their own car repair garage in Lambert Street, Hull. However, after twelve months work started to diminish and the brothers decided to expand into another market as they began to produce dolls prams. Machinists were brought into the garage and a small number of women around the region were employed to make pieces for the prams in their homes. The toys sold well and between 1946 and 1947 where 4,750 produced and distributed throughout Britain. Unfortunately, we have been unable to track down an original. Hull Daily Mail, 1 Aug 1966. As business started to expand, Fred and Harry agreed to invest their capital into yet another business venture, this time they decided to make hen batteries. When delivering and installing these large chicken coups to farms around East Yorkshire, the partners learned that the maintenance and production of farm machinery had suffered extensively during the war. The brothers then had a fantastic idea, they would buy old war vehicles which were being sold near Doncaster and make them into brand new trailers. The brothers got to work designing and producing the first Weeks trailer and delivered it to the farmer who originally sparked the idea. His response was that he wanted two more. The second Weeks trailer was produced and taken to Beverley market in 1948 where it received excellent reviews. In total eleven trailers priced at £125 each were ordered that day. By 1949 business was booming and the rented lock up garage was no longer sufficient in size to contain the growing business. Eventually the pair agreed to open their new headquarters in a large old mill on Oxford Street in Hull. Weeks & Co was proving to be a well-known and respected business brand in the farming community. 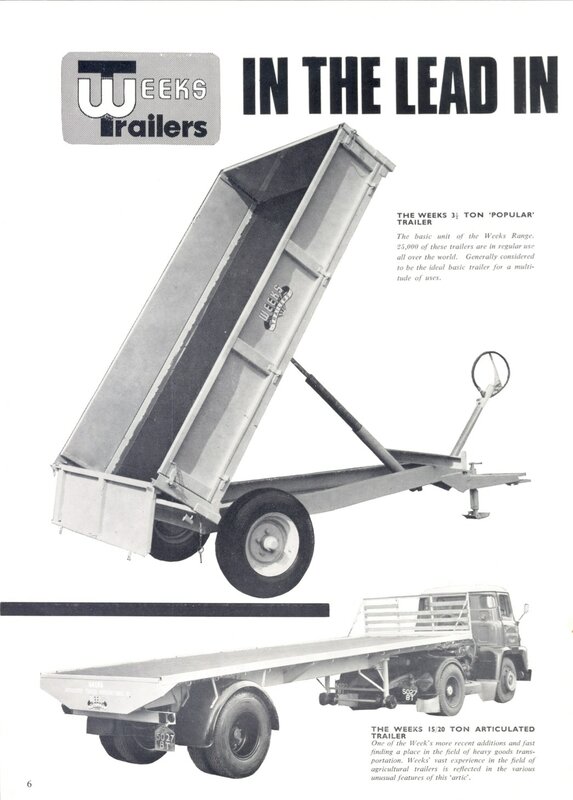 However, in 1958 they made their most successful breakthrough, Harry and Fred had designed and introduced into the market the WEEKS ALL-STEEL TRAILER. The first was produced in November and the partners agreed they would unveil the machine at the Smithfield Show. Immediately, one of their most loyal customers ordered two and requested their delivery to his farm in Burton Constable. However, despite overwhelming interest, they were not an immediate success as farmers remained unconvinced by the all steel construction. However, once their potential had been realised they started to sell quickly and revolutionised the agricultural sector allowing large quantities of grain and foodstuff to be transported in one journey. The Weeks brothers were fantastic at interpreting the market and using their engineering skills to supply farmers with cutting edge technology. In 1961 advancements in cattle farming, prompted Fred and Harry to produce a high sided 3 in 1 trailer. This was a success from the outset. The business was expanding rapidly as Fred, Harry or a representative travelled all over the world to promote their products. The Weeks brothers also started to make industrial trailers which added further to the company’s success. To accommodate its growth, the business was moved to Ferry Road, Hessle in May 1968. The factory is remembered by Fred and Harry’s children fondly and from their stories it is apparent that, although in the company’s most prosperous years over 300 men were employed, both Fred and Harry valued every worker and went out of their way to show their gratitude. The brothers ensured they could complete every task that they asked their workforce to perform so that they understood every aspect of their business. 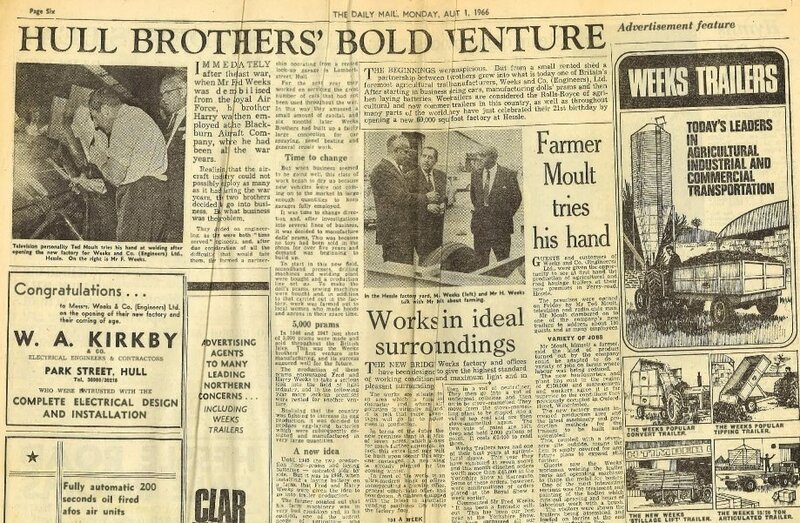 Fred and Harry had built an international business empire which not only presented them as pioneering entrepreneurs in the community but also on the world stage. 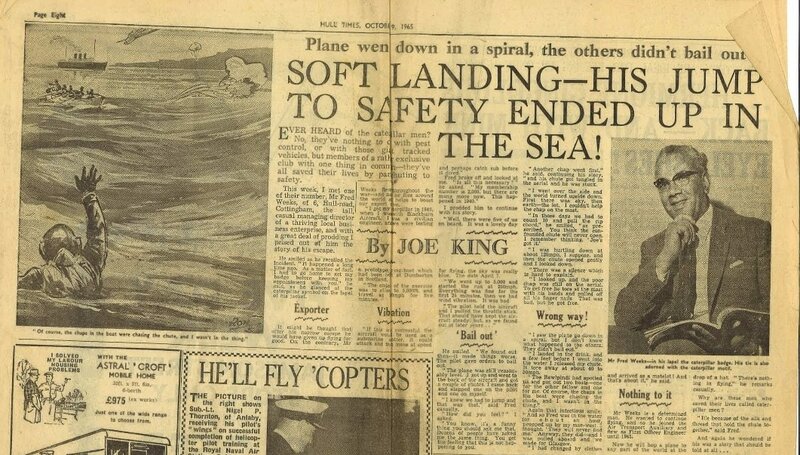 Hull Daily Mail, 14 July 1942, p. 1. Hull Daily Mail, 30 August 1938, p. 8. Hull Daily Mail, 2 Spetember 1938, p. 12.